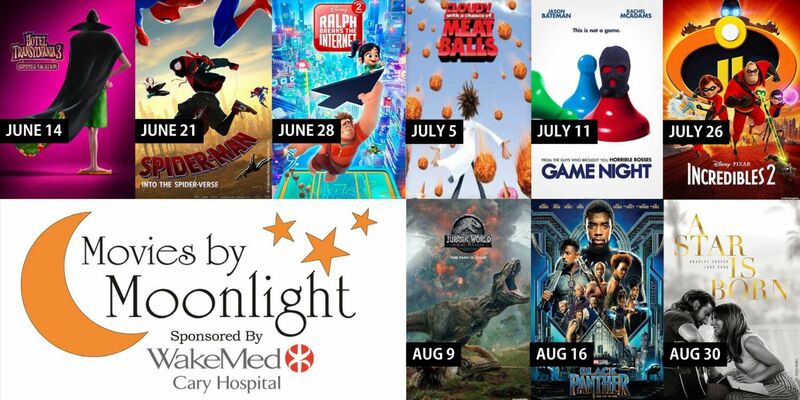 In what has become a beloved and popular summer favorite, the “Movies by Moonlight” Series will return to Cary’s Booth Amphitheatre for another stellar season presented by WakeMed Cary Hospital. On designated “movie” nights from June through August cinema buffs are invited to attend this family-friendly event that provides the perfect opportunity and atmosphere to sit back, relax and enjoy the stars of the big screen under the stars at one of the region’s most popular venues. Patrons are allowed to bring in picnics so plan on making “Movies by Moonlight” part of your summer schedule. Please log on to www.boothamphitheatre.com for the most up to date movie schedule, movie synopses, ratings and reviews from The Cary, the Town’s premiere movie house. Tickets on sale starting Friday, March 29th. Tickets can be purchased at Booth Amphitheatre (Monday - Friday, noon - 6 p.m.), through etix.com, or by phone at (800) 514-3849. Etix phone hours: Monday-Friday/ 9 a.m.- 8 p.m. EST Saturday/10 a.m. – 8 p.m. EST & Sunday/noon – 8 p.m. EST. For complete concert information go to www.boothamphitheatre.com or call (919) 462-2025.